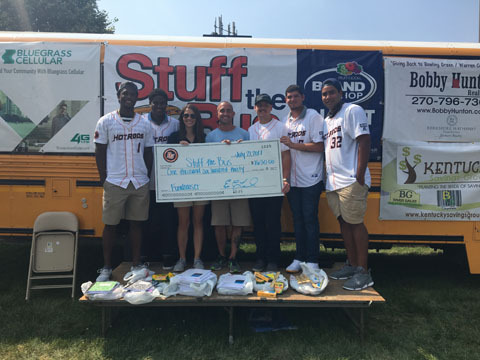 The Bowling Green Hot Rods have been assisting organizations in raising money and awareness for their organizations for over 9 years. The Hot Rods are pleased to announce that we will again be hosting fundraisers for the 2018 season with two options for organizations to raise money and awareness. Option #1 - Our traditional fundraiser consists of an organization selecting a specific game and selling tickets for that game to raise money. Organizations will sell tickets for $10 each for their game andretain $5 of every ticket sold. You can pre-purchase tickets or pre-sell them using a provided order form. You must sell a minimum of 30 tickets in order to receive half of the ticket proceeds. We can also provide your group with a marketing flyer to help make your night a success. Option #2 - The Hot Rods Fan Pack is one of the best deals offered at the ballpark. Each pack hasover $300 in value and includes 8 undated box seat vouchers, $50 off a Hot Rods birthday party, $100 off a Hot Rods suite rental, free carousel ride, free speed pitch throw, free game program, 10% off your entire purchase in the Body Shop, 20% off purchase of any single item in the Body Shop, and a bring a friend BOGO (buy one box seat, get one free). To sell the Fan Pack as a fundraiser, you can pre-purchase the packs or pre-sell them using a provided order form. You must sell a minimum of 20 packs in order to receive the proceeds. For every pack you sell at $35, your organization will receive $10. Your customers will receive a great value and in return you earn support for your organizations! As a bonus for any organization that participates in a fundraiser, we would love to have your band, choir,cheer team, etc. to perform during your selected game. It helps make your fundraiser and our game more entertaining for your participants and families to enjoy. If you are part of a charitable organization you can also be one of our WNKY Community Organization of the Night. To book your FUNdraising campaign or for more info please contact the Hot Rods Group Sales department at groupsales@bghotrods.com.